If you were going to write a script that was supposed to have a David versus Goliath ending, the northern 4A football championship game just might be the right backdrop. The undefeated, and number one team in the state of Nevada, was at home against Bishop Manogue , a team they had manhandled back on September 28, by a lopsided score of 63-28. Just one more win and Damonte Ranch would be back in another state semi-final game. The problem was, this was not the same Miner team. The Mustangs won the coin toss and took the ball. Why not? They had the top point-producing offense, with the soon to be the most prolific passer, Cade McNamara, that has ever played in the Silver State. After McNamara completed a 57 pass, Derrick Knoblock scored on a seven yard run. Benny Marshall’s kick made it 7-0. On their opening possession, Bishop Manogue came right back when Zeke Lee broke through the left side of his line and ran it in from 16 yards. Gonzalo Martinez added the extra, making it 7-7. Still in the first period, Knoblock got his second score. This time he busted in from just 3 yards. Again, Marshall, who had successfully completed 95% of his extra point kicks ( 78 of 82) was good, making it 14-7. In the second period, the Miners QB, Drew Scolari, hit Dontell Jackson for 37 yards. Then he found Peyton Dixon on a perfect 25 yard post pattern for their second score. Again, Martinez was good, and it was tied at 14. 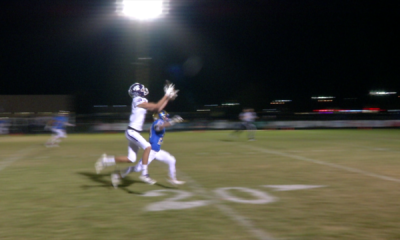 After Damonte Ranch was stopped on their third possession, the Miners went back to Dixon. He scored his second rushing touchdown on a 25 yard run. 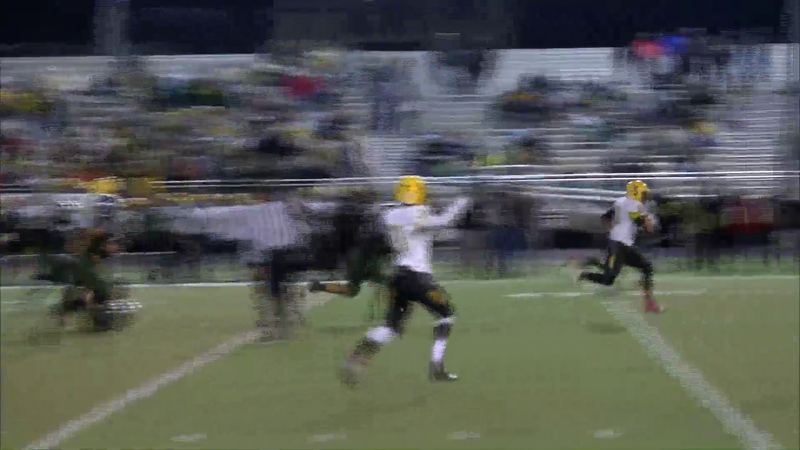 The kick made it 21-14, and gave Bishop Manogue their first lead in the game. Still in the second quarter, Damonte Ranch showed that they are not just a passing team as Knoblock got his third rushing touchdown on a nifty 25 run. The Marchall kick tied it at 21. With time running out in the second, Dixon broke an arm tackle at the line of scrimmage and outraced the defense for a 57 yard TD run. Martinez made it 28-21 at the end of the half. In the third period, Scolari found the 6’6″ TE Curtis Luckadoo all alone in the back of the end zone for a four yard completion. The extra point gave the Miners their largest lead of the night, 35-21. On the following possession, McNamara marched his team down the field with his arm, but brought the Mustangs back with his legs on a 13 yard scramble run. With their lead back to seven, it was more of Dixon. He finished off a time consuming drive with a 14 yard touchdown run. This time the extra point was off to the left and the lead was now 13. But, again it was McNamara who calmly led the drive back into scoring range. His 11 yard scoring pass, his only passing touchdown of the night, was to brother Kyle. Marshall again was good, and now the lead was just 6. After a Ethan Kulpin interception of a Scolari pass, the stage was set for yet another late comeback for the Mustangs. With 1:36 left, McNamara threw into double coverage at the Miner five yard line. Linebacker Vai Kaho, dropping into coverage made an over the head “pick” and the drive was over. Three running plays by Bishop Manogue lost 4 yards. On a third and 14, Scolari, throwing out of his end zone, and looking for Luckadoo, was intercepted by Christian Jamieson at the nine yard line. Jamieson went untouched for the score tying the game at 41. With just 51 second left, the extra point could win it for Damonte Ranch. But, after the return by Jamieson a major penalty was assessed. The normal “chip shot” kick was now from 25 yards. The kick was left of the upright. When regulation time expired the game tied. The Mustangs again won the coin toss, and elected to take the ball from the 10 yard line, rather then go on defense. It paid off. Knoblock ran it in on the third play. Marshall’s kick made it 48-41. On their possession, Bishop Manogue gave the ball to Dixon once and he went the 10 yards to make it 48-47. Rather then kicking the extra point, and sending the game to a second overtime. The Miners ran a play fake. On a play action pass, Scolari faked the handoff to Dixon, then rose up to find his running back standing in the end zone alone for the two point conversion. The underdog Miners, ranked number #7 in the state had beaten the number #1 Mustangs. The game had something for everyone. Throughout the night, Bishop Manogue Head Coach, Ernie Howren, made decisions on his play selections that were high risk and high reward. Repeatedly, they worked. Not to be outdone, Shawn Dupris, head man at Damonte Ranch used his wide open play book and roster to maximum advantage. His use of times-out at the end of regulation gave them a chance to win. If you saw the game, you saw a classic. If not, you will hear the stories for quite some time of what a great one it was. Individually, Scolari was 7 for 11 passing for 142 yards and a touchdown. McNamara completed 21 of 33 for 289 yards and a score. Dixon had 309 yards in 38 carries with three rushing and one receiving touchdown, while Knoblock had 23 runs for 129 yards and four scores. Bishop Manogue had a team total of 378 yards rushing. Damonte Ranch had 185 yards on the ground. The Mustanga had 22 first downs to the Miners 18. Bishop Manogue was the more penalized team with 130 yards. compared to 125 by Damonte Ranch. Bishop Manogue will play Arbor View in a state semi-final game at McQueen High School on Saturday November 24 starting at 1pm. The video highlights of the game are below.